Why Should You Go with Swift for iPhone App Development? The launch of iPhone in 2007 changed the way the smartphone industry worked. Its unique approach and innovative techniques have always given it a competitive edge over its competitors. With one of the most loyal user base globally, iPhone acquires an overall 94% of the total smartphone industry profits. It must be known that the efficiency and seamless performance of iPhones encourage people to spend an average of $35 on apps yearly. This figures and statistics are enough to prove how iPhones never ceases to amaze its users. In this context, Apple came up with the launch of Swift in 2014 at its Worldwide Developers Conference. It is a high-end programming language developed exclusively for making efficient iPhone apps. Being a secure and contemporary programming language makes it the first choice for anyone looking for an iPhone app development service. The benefits and high level of interactivity in development have made Swift a well-known and most sort out service for iPhone app development service. Hence, if you wish to build an iPhone app for your business, opting for Swift is a great way of having a world-class app developed. Still wondering why you should go with Swift for iPhone app development service? Let’s get you updated. Open source: Open source allows start-ups and small businesses to develop apps through cost-effective ways. So, one of the reasons of Swift being everyone’s favorite is its open source approach for iPhone app development services. The huge support offered by the open source community makes Swift a popular choice for app development and opens a plethora of opportunities for start-ups and small businesses. Easy and effective in use: The app development approach of Swift is very easy, simple and effective. It allows developers to easily modify and incorporate new features and functions within the application. In addition, Swift comes with easy and convenient keywords and syntax. This makes it very easy to learn and understand. In fact, it is almost similar to the English language. Hence, a considerable amount of people are bringing Swift for their iPhone app development service. Fewer and faster code development: As the name itself suggests, Swift is known for developing codes swiftly and instantly. With its ability to do coding in fewer lines, the apps developed through Swift require less time in development. Furthermore, the presence of in-line coding within Swift makes it easier to fix bugs. These features don’t only lower the app development cost but, also saves you from a lot of unnecessary efforts. In short, Swift is simple, readable and error-free. High-end performance: It is seen that apps developed through Swift deliver seamless performance with no or fewer crashes, making it very effective and efficient. In addition, this high-performance language allows developers to have complete control over the apps they develop, giving them the opportunity to come up with high-performance solutions. Easy maintenance: Swift provides its apps with high-end security which is critical for any iPhone app development service. The tighter the security of app, the higher is the chances of user retention and engagement. The easy to maintain and secure apps is what start-ups and businesses crave for and no doubt, Swift is doing a great job at it. Instant app loading: iPhone app development services provided by Swift make use of an extensive and dynamic library which allows it to load directly into the memory. This reduces the overall size of the app and triggers instant app loading along with enhancing its performance. The above-mentioned points depict a clear picture of how Swift helps in effective iPhone app development. Its instant, secure, cost-effective, simple and bug-free services are loved by developers all over the world. Hence, opting for Swift for your iPhone app development service is the best decision you will ever make for the success of your business in the long run. 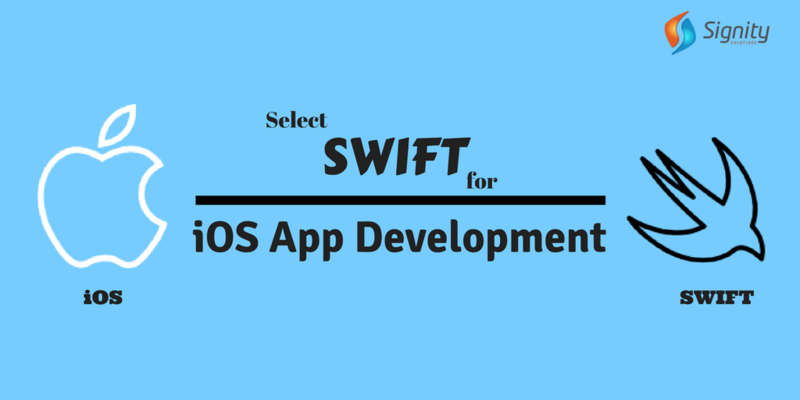 Want to acquire iPhone app development services through Swift? Connect with Signity Solutions, one of the best App development companies in India. For any queries, contact here and we’d be happy to help you.